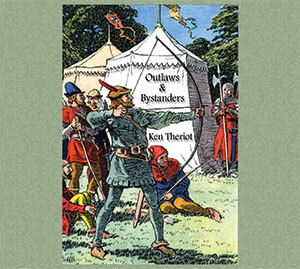 Album Release Concert For "Outlaws and Bystanders"
Ken Theriot’s new album – “Outlaws and Bystanders” – was released at the concert held on Wednesday, March 12th at The Green Dragon Tavern during Gulf Wars 2014 (an event of the SCA). Ken and Lisa Theriot were joined by their stalwart band-mates, Kevin Valiquette and Michele Buzbee, as well as Robert Ferrell on percussion. Where Can We Get The Album? You can get the album on iTunes (along with Amazon, Spotify and most every other digital retailer). You can download a PDF file of all the lyrics, along with information about each song, here.